On the Seven of Pentacles we see a man who has labored long and hard in his garden. The foliage is full, the blossoms are out – it seems that his work has paid off. Now he’s taking a break to admire his hard work. In a tarot reading the Seven of Pentacles is a time-out card. It represents those moments after a rush of activity when we stop to catch our breath and look around. The man in the picture has paused to contemplate the fruits of his own labors; the Seven of Pentacles can indicate a reward that will come your way, particularly as a result of your own efforts. The Seven of Pentacles tarot card is also a call for assessment. When we’re busy, we don’t always have time to reflect on what we’re doing and why. Are we still on course? Are we getting the results we want? Serious problems can develop if you don’t take stock at key moments. In readings, this card suggests that you take the time to be sure you’re meeting your goals. 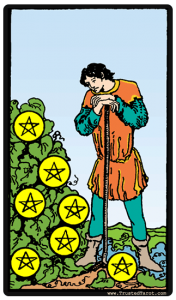 The Seven of Pentacles can also indicate a crossroad. You’re not yet committed to a certain path, but you could be soon. Change is still possible. Once you’ve gotten your breath back and checked your strategy, be ready to jump back in and work even harder than before. Your work is likely to be doing well and you will be reaping the rewards of past efforts. This card is an excellent omen for finances. You are likely to have invested wisely, either in terms of traditional investments or in terms of your time and energy. The Seven of Pentacles strongly represents being close to retirement and the end of years of hard work, commitment and dedication. The time is coming for you to put up your feet and take a well-earned rest. Leave the hard work to someone else now as you have proved your worth and done all you can. The money is there for you should you decide to return to study, open a business, travel or even to start a new hobby. With regard to love, the Seven of Pentacles points to things going well for the person that you have your heart set on. If you are not in a committed relationship, you need to be open to other possibilities. Harvest Time, Rewards, Results, Profit, Payouts, Dividends, Shares, Bonus, Benefits, Large Inheritance, Trust Fund, Nurturing, Cultivating, Gestation, Thriving, Flourishing, Money Growing, Savings/Investments Maturing, Manifestation of Ideas/Ambition, Hard Work Beginning to Pay Off, Finish What You Start, Progress, Personal Fulfillment, Quiet Confidence, Personal Success, Careful Planning, Business Plans, Goals, Focus, Commitment, Perseverance, Tenacity, Patience, Reflection, Nearing Retirement, Farming.